Some of these cards may be going to my SIL to use as thank you cards for contributors to her March of Dimes Team. She liked these but I am also working on some with the March of Dimes ribbon for her. Regardless of which ones she picks, I am also making a batch of these for one of my local Relay for Life team for them to sell to raise money. The ones I make for Relay for Life are going to be Birthday cards in honor of the American Cancer Society movement for More Birthdays. My father will not be celebrating his this year but I wanted to do something to help others celebrate theirs. Creative Sisters Monday Challenge Embossing Challenge...Thank you Linda for inviting me to submit my Fluttering By card for the challenge but I really wanted to submit a new one that has so much more meaning behind it. Cute! I love the purple leaves. Thanks for playing along with us at CTO! Love the embossing, thanks for playing with CTO! Amber, this card is beautiful. I love how you embossed the tree. You are making these cards for a great cause, I wish you well and hope you sell a lot of them. I love this card. Thanks for visiting my blog. I am now your newest follower! You did a great job with your card. I love all the colors that you used. I also love the embossing. Thanks for playing with us at CTO. Very nice card, you did a great job with this card, I hope you do well with the challenges! Thanks so much for Celebrating the Occasion with us! This is just amazing. And, you've inspired me to make a set of cards for friends who will be doing the relay for life this year. Please hop by and check out my blog for another chance to win some blog candy! mmmmm!!! !, very nice work dear! Thanks so much for joining us at CTO!! What a beautiful card! Your embossing gives it the perfect touch! 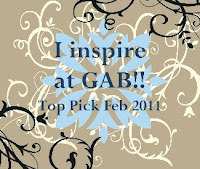 Thanks so much for joining us at GAB this week! Such a pretty card! I love the embossing on the background and then the pattern on the tree, so cute! Thanks for playing along with us at CTO! Beautiful card!! Love the soft colors and the pretty bow! Thanks for joining the fun at Celebrate the Occasion! Beautifully done. Thanks for joining us. Beautiful card. Love the colors you used. Thank you for joining the GAB Challenge this week. This is a beautiful card. Love the colors and the embossing. Thanks for joining us at GAB Challenges.